DUG Insight User ManualFrequently Asked QuestionsFrequently Asked Questions PetrelHow do I export polygons from Petrel to import into Insight? DUG Insight can load IESX format polygon files that have been exported from Petrel. Right click on the polygon in the Petrel navigation tree and select Export. Polygons should be exported as IESX fault polygons (ASCII) with a .dat or .iesx extension. 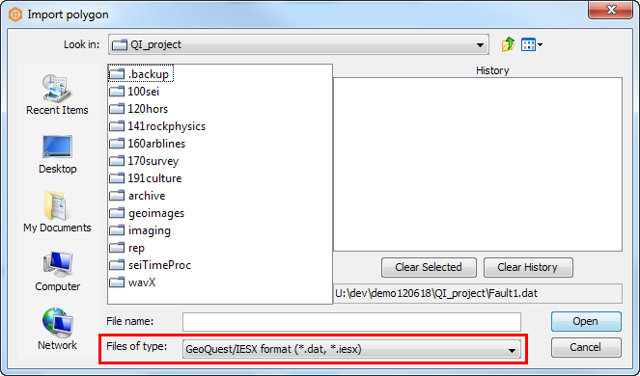 In the Import Polygon window, change the Files of type to GeoQuest IESX format. Browse to the polygon that was exported from Petrel and click Open. Prev: How do I send the Petrel message log? Next: How do I manually remove the Petrel Link?